Another great user group conference, I only stayed till Thursday morning as we had a UKOUG event that evening (see next blog) but I attended enough to realise that if you are looking for best practice at how to enjoy yourself, you need look no further than to HrOUG! 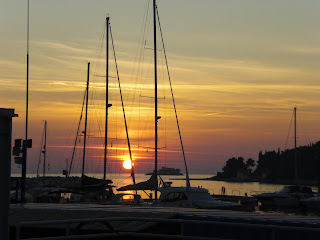 Set in the beautiful Rovinj, the setting as well as the event were superb. Sessions ran from 10am (if you party all night any earlier is impossible) until about 8pm each day when everybody had dinner together, then the entertainment began for at least as long again! When I left Thursday the leader of HrOUG Davor (on the right) had been for a healthy swim, except it was simply to wake him up as he had only been in bed for 3 hours! The hospitality was fantastic, and all the delegates were enjoying themselves. I only attended a few sessions as my Croatian is non existant. I spoke on Fusion and usergroups and again I thought the numbers were on the low side but those who attended learnt a lot and asked even more questions. There was an interesting discussion on the impact Fusion Applications will have on bespoke system devleopment in the future. I quoted our own Ronan Miles who a few years back 'If Fusion Applications are a sucess, and Oracle will ensure they are, then it will change the way everyone writes applications. I was interested to discoverer that the issues I have had obtaining resources for Hyperion install (not configuration and devleopment) are the same in Croatia. Thank you to Vlado and Davor for their excellent hospitality.